Rowland Blvd., between South Novato Blvd. and Redwood Blvd., will remain open to vehicular traffic. There will be traffic safety personnel from Ghilotti Construction providing traffic control. Access to Leafwood Dr from Rowland Blvd will not be accessible to motorists beginning on November 29th to December 2nd from 7 a.m. and 5 p.m. Please access Leafwood Dr from Sunset Parkway. Mainline pipe installation will begin tomorrow, 11/29/16. The crew will be starting on Rowland Blvd and heading east towards Redwood Blvd. If things go well, they may be as far as Redwood Blvd near Scottsdale Pond by the end of the week. There will also be HDD (Horizontal Directional Drilling) taking place on Redwood Blvd near Scottsdale pond and likely on Redwood Blvd between Seascape Drive and Larch Drive towards the end of the week. Starting on 11/21/16 there will be a crew performing Horizontal Directional Drilling (HDD) on Redwood Blvd near Scottsdale Pond. We expect this work to finish on 11/23/16. HDD work will then move to Redwood Blvd near S Novato Blvd starting on 11/28/16. Below are some pictures of the HDD operation on Rowland Blvd to give you an idea of what to expect. There will also be a crew moving along the entire alignment potholing the existing utilities. They will be on Redwood Blvd on 11/21/16 and working their way South throughout the week. Expect short delays and lane restrictions. You will start to see work this week primarily on Rowland Blvd and Redwood Blvd. There may also be some work taking place on S Novato Blvd towards the end of the week. Starting Tuesday crews will be potholing the existing utilities. This means there will be a small crew digging to find the existing utilities so we know the depth and location of each utility before installing the new pipeline. This helps avoid damage to existing infrastructure and avoid timely delays during construction. Below are 2 maps to show where work will be taking place. We anticipate crews on Rowland Blvd and Redwood Blvd starting Tuesday the 8th through Thursday the 10th. 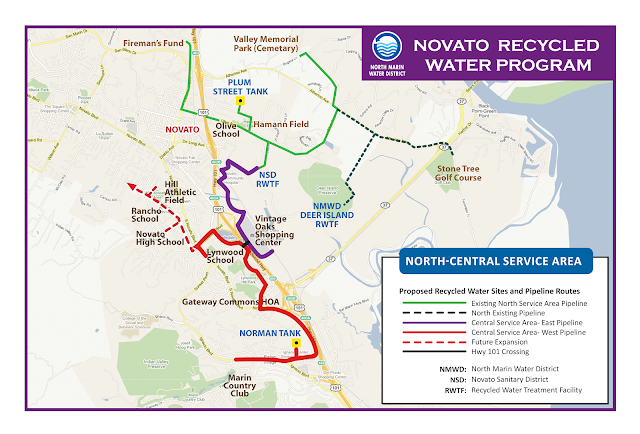 Then if everything goes according to plan, they will start on S Novato Blvd on Friday the 11th. Stay tuned for more updates. The North Marin Water District (the District) has important improvements to the recycled water distribution system coming soon in your neighborhood. In addition to offsetting potable water supply, water recycling provides a sustainable drought-proof water source and promotes other environmental benefits such as preserving a healthy San Francisco Bay and surrounding wetland habitats. During an earlier phase, projects in the North and South Service Area were successfully completed in 2012. The Central Service Area Projects (this phase) include the installation of new recycled water mains and services within the public right-of-way, rehabilitation of an existing water tank and retrofitting existing large landscape irrigation and car wash sites for recycled water use. Collectively, these projects will help reduce potable water consumption by approximately 200 million gallons per year.